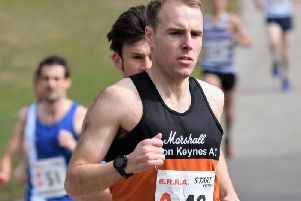 Marshall Milton Keynes AC swept to victory in the fourth round of the Chiltern Cross-Country League matches held at Wigmore Valley, Luton. They increased their overall lead over Bedford by nearly 1000pts. Looking ahead to the fifthth and final fixture being hosted in Campbell Park, the club must be favourites to regain the Division One League back from Bedford. On the day MMKAC won by 348pts and in the eight scoring team races they won three and placed second in another four. The winning senior men had 28 runners in a field of over 200 and their scoring ten were in the top 50. Steve Tuttle continued his good run of form with 3rd place chased home by Chris Hearn(11th), George Wheeler(18th), Charles Wheeler(19th),Tom Comerford(24th), Jonathan Peters(27th), Graham Jones(34th), Josh Lyman(35th), Ross Threfall(42nd) and Steve Green(47th). In the age group categories Steve Herring finished 54th overall and 8th M40. John Skelton ran to 3rd M60 with Paul Mason 4th and Kelvin Smith 5th. The under 17 men were narrowly beaten by Bedford but placed their first 3 scorers in the top 5. Alfie Yabsley again raced to 2nd place (and took revenge over Will Perkin/Chiltern Harriers who beat him for the gold medal in the Bucks AA Championships a week earlier). Conrad Webber(4th) and Ewan Forsythe(5th), ran to their best ever Chiltern League positions. Morgan Smith completed the team in 21st place. Jack Meijer, after 3rd places in the previous two races, had a great win in the under 15 boys and led Tom Sharp(5th), Finlay Gibbs(7th) and James Dowsett(11th) to a team victory. Chiltern Harriers won the under 13 boys team race over MMKAC. Here Jack Sharp placed 6th, Leo Freeland(12th), Alex Brent(13th) and Ben Green (17th). Over a 100 started the senior women’s race and MMKAC had a narrow win over Chiltern Harriers in the team event with fine packing by the scoring quartet of Lara Bromilow(5th), Nadine Lewycky(7th), Gemma Childs(11th) and Natasha Baker(17th). In the veteran age groups Debra Brent was 7th F45 and Diane Farmer 6th F55. A weakened u17/20 ladies team did well to finish 5th. Newcomer Georgia Flawn-Thomas was their first runner home, 15th followed by Jade Brown(23rd), Jodie Wright(29th) and Anna Radford(31st). The under 15 girls saw another close duel between Enya Deysel and Montana Edghill, finishing 4th and 5th, just 3-seconds apart. Gemma Milne placed 10th and Jessica Nuttall 12th as their team were very narrowly beaten by Bedford on the day. As always there were a very enthusiastic group of under 11’s competing. They do not score in the match but gives them experience of what to expect once they move to the under 13 age group. For the girls, Sonja de Koning placed 6th, Ella Nash 17th and Daisy Yabsley 23rd. Sebastian Henry led the boys home in 8th with Harry Rose(26th) and Kian Nicholson(32nd). Going into that final match next month MMKAC teams look on target to win four of the age groups team awards with the other four team set for podium places.